It measures body weight, body fat / water and calories at one time. Strong tempered glass structure holds weight up to 400 lbs. Detatchable remote control. The scale can be used in two modes. 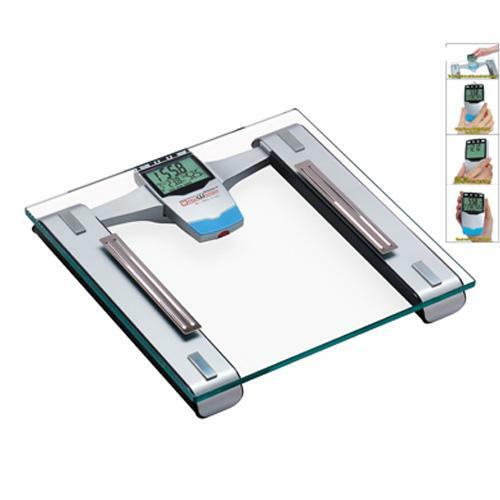 When the remote control is attached on the scale, it has auto-on function for direct weighing. Both modes are fully functional in measuring body fat / water and calories. Anti-moisture system implemented, ideal for bathroom. Stores 12 persons' data, good for whole family use. Recall previous readings of body fat, easy to track history figures. This function can be turned off easiliy. Platform size: 13" x 13"
LCD size: 12" x 1.5"